The dtu10mdt_interp function loads and interpolates the DTU10MDT mean dynamic topography dataset. There is no particular installation procedure, but you'll need to download this dataset: ftp://ftp.spacecenter.dk/pub/DTU10/1_MIN/DTU10MDT_1min.nc After downloading the data, make sure Matlab can find the dataset and this function. Then you should be able to use the dtu10mdt_interp function. mdti = dtu10mdt_interp(lati,loni) gives the mean dynamic topography in meters at geo locations lati,loni. Note: large areas of lati,loni will take longer to load and interpolate. That's pretty ugly out of context, so fill in some borders with my function from File Exchange. 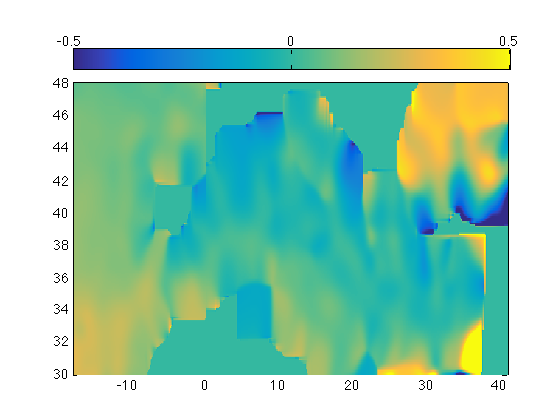 And it's an anomaly, so we might as well plot with a diverging colormap from cmocean (Thyng et al., 2016). This function and supporting documentation were written by Chad A. Greene of the University of Texas at Austin (UTIG), December 2016. Andersen, O. 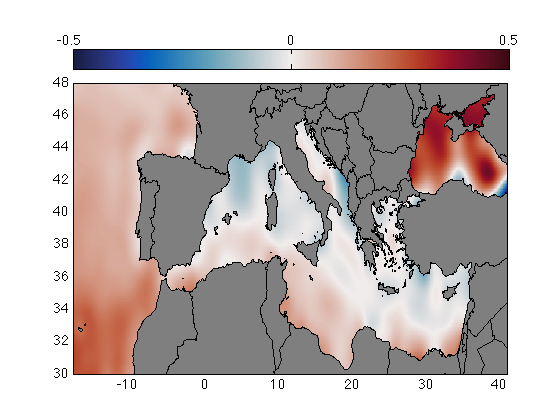 B., and P. Knudsen (2009), DNSC08 mean sea surface and mean dynamic topography models, J. Geophys. Res., 114, C11001, doi:10.1029/2008JC005179. Greene, C. A., Gwyther, D. E., & Blankenship, D. D. (2016). Antarctic Mapping Tools for Matlab. Computers & Geosciences. doi:10.1016/j.cageo.2016.08.003.